Students interviewed each other and adults in their school about what makes a good life and the role of school in society for our pilot school partnership #studentvoice project. Yesterday they identified themes from their interviews and presented to their peers. Read their interviews! A big thank you to James and Rebecca at InnovationWithin, who let our students use their state-of-the-art software to autotranscribe their interviews! Are you a teacher interested in doing this project in your classroom? Email us! The project is a perfect example for this month's big shift: Outcomes to Practice. It's who students practice being in school that will drive outcomes, not just creating better outcome metrics. Are students practicing creativity, curiosity, empathy, meaning making, and citizenship daily? If so, they will develop it. If not, unlikely. Tye's blog about one of his students, Emma, brings this powerfully to life. We hope you enjoy (and share!) the stories and articles this month. We spend over 14,000 hours in school between K-12. This makes it an incredibly important place for habit formation. Think of the 10,000 hours of practice rule Malcolm Gladwell popularized from Ericsson’s research: Those 14,000 hours make us experts in who we practice being. This means that how we do school, and who we practice being in school greatly influences who we ultimately become. Who are students practicing being today? What kinds of daily habits are they practicing while in the classroom? This is who they will become. Emma was one of my students for 4 years - from the time she entered preschool until she graduated from 1st grade – and she was one of the most joyful students I have ever worked with. Her smile would light up a room and her laugh would bellow through the halls. She loved people and games – especially playing Simon says or other copycat games – and her energy and joy were contagious. I would often schedule Emma at the end of my day so that I could leave on a positive note. Emma was also profoundly impacted by her disability. She had no vocal language beyond a few consonant sounds, most of her cognitive abilities were within the 1st percentile, and her progress towards academic and social goals was exceedingly slow. "A good life is being successful - holding a job, having a house, and a dog; any kind of dog." Read all of the interviews from our pilot project here. David Labaree, author of Someone Has to Fail, and Professor at Stanford University, joined us at our book club this month for an intense and rewarding discussion on the goals of schooling, access and advantage, and equity. Next up in June is Ted Dintersmith's new book What School Could Be. We meet one Monday evening per month to discuss interesting books and ideas in education. There are in-person and online options. Are you someone who is keen to get your student involved in deep meaning making? We're looking for teachers who want to start the school year with their students exploring big, rewarding questions about life and school. 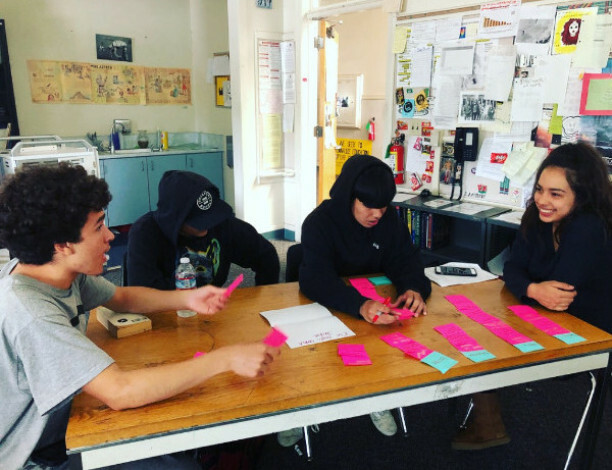 Help us bring this powerful classroom visioning project to new schools! Share this month's posts on Twitter! Use the example tweets below, or create your own. "If we want a child to be well and do well in the future, we need to provide an environment in which they can practice being well and doing well now." We work with people like YOU across the country: Catalysts - individuals, classrooms, schools, and community organizations - who interview people in their communities and foster empathy nationwide by sharing the stories on our website and social media: Instagram, Twitter, and Facebook(@reenvisioned). Please follow us and spread the word!